Winter squash has taken its prominent place in the market – every colorful variety: pumpkin, carnival, delicata, acorn, hubbard, and butternut (just to name a few). I’m a huge fan of roasting vegetables all fall and winter long, and it’s the sudden sight of all that gorgeous colorful squash that gets me pulling out the roasting pans. 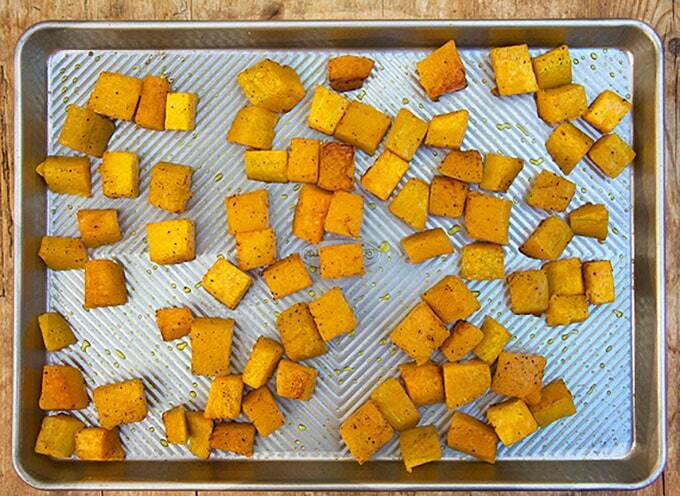 Butternut squash is a great candidate for roasting. 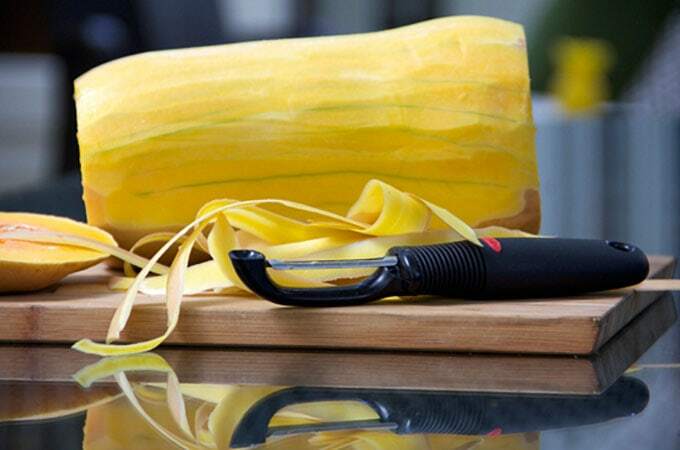 The first step is to peel and cut the squash. 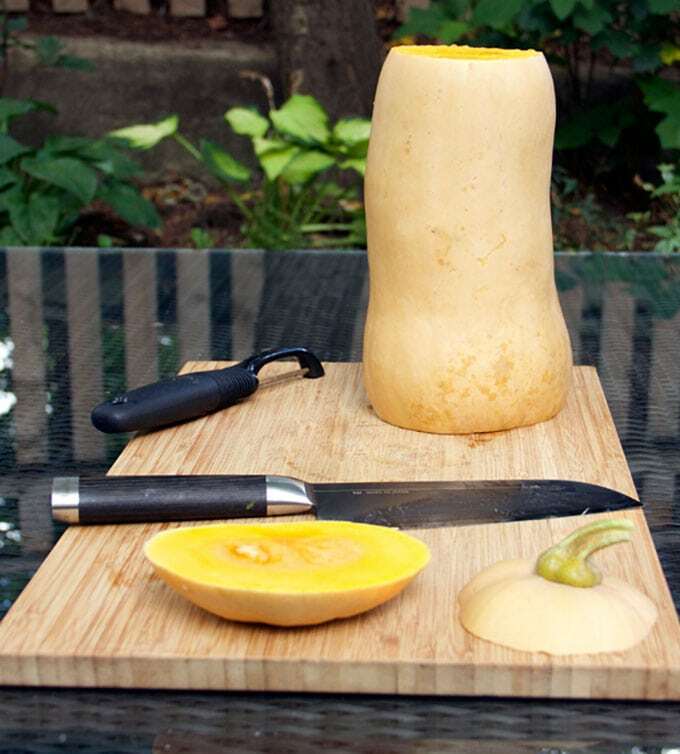 I used to be daunted by the thought of peeling and cutting a butternut squash. I’d always buy it pre-peeled and cut at the store. But once I dove in and tried it myself, I realized it’s not that hard to do. I generally cut off the ends first, giving it a stable base. Then I peel it with a regular vegetable peeler. Standing it up makes it easier to cut in half. Then you can scoop out the seeds and stringy parts with a spoon. Then cut it into whatever size cubes you like for roasting. 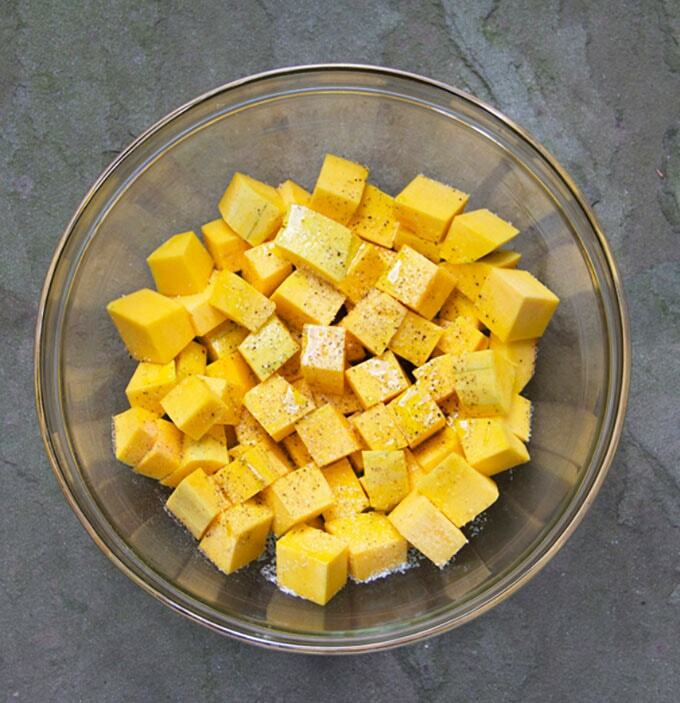 For this recipe I like large, 1-inch cubes, because the squash roasts up nice and brown in spots, yet it doesn’t fall apart or get mushy. 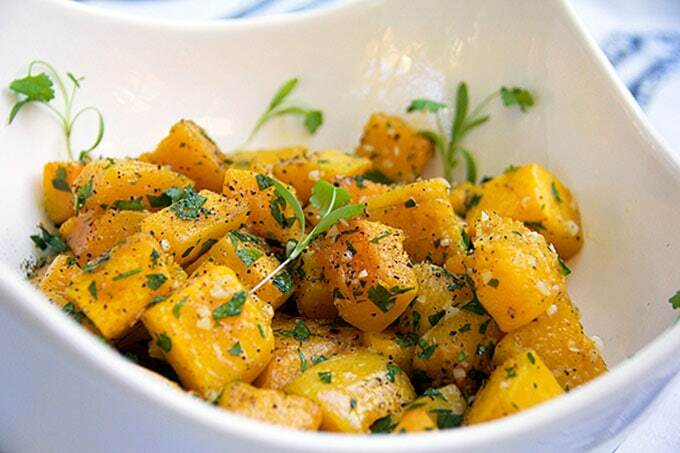 I toss the squash cubes with olive oil, salt and pepper…. ….then spread them onto a roasting pan, and pop them in the oven for about a half hour. That’s it! They’re actually really tasty just like this, but I love the flavor addition of sautéed garlic and parsley to the sweet, nutty roasted squash. This dish goes beautifully as a side to almost anything! It’s great hot from the oven but also delicious at room temperature. This recipe is adapted from a recipe by one of my favorite chefs, Alice Waters, from her Chez Panisse Vegetables Cookbook. 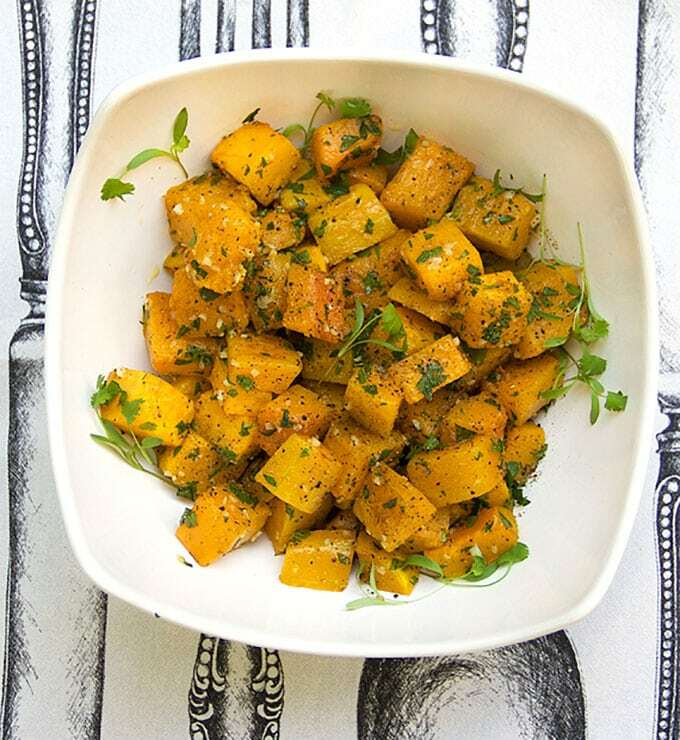 Here’s the recipe for Garlicky Roasted Butternut Squash. If you try this recipe I hope you’ll come back to leave a rating and a comment. I’d love to know what you think! To help get you into the swing of Fall cooking, here are fifty recipes from the talented food bloggers of The Sunday Supper Movement. Enjoy! You had me at garlic! I love roasting butternut! It’s so compatible with so many different herbs and spices. And perfect with garlic!! This looks like the ultimate fall dish! I always have a heck of a time dealing with my butternut squash! Thanks for the tips, and the terrific recipe! I love all the garlic you used here! Butternut squash is sweet enough, I don’t always enjoy adding sweet elements to it, and I often add elements that will purposely detract from the sweetness (in savory dishes anyway). Thanks for posting! Great tip about the vegetable peeler – this sounds terrific! What a delicious side dish! Umm! Simple and delicious! 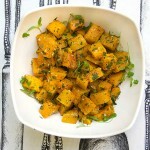 Perfect side dish for both everyday and entertaining! Butternut squash is one of my favorite things about fall. This is a great way to prepare it! 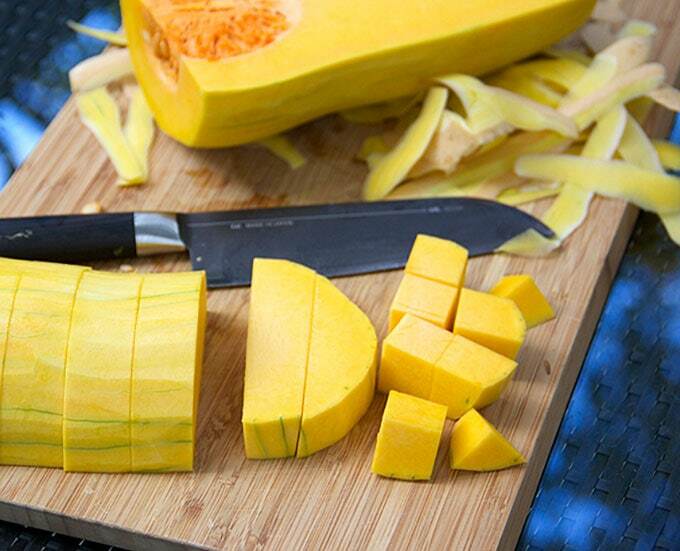 Great tips on how to cut the squash! I have to remember to wear gloves whenever I do – I’m one of the lucky folks who gets a rash handling butternut squash! This is so simple, but so good! I love recipes like this; YUMMM! 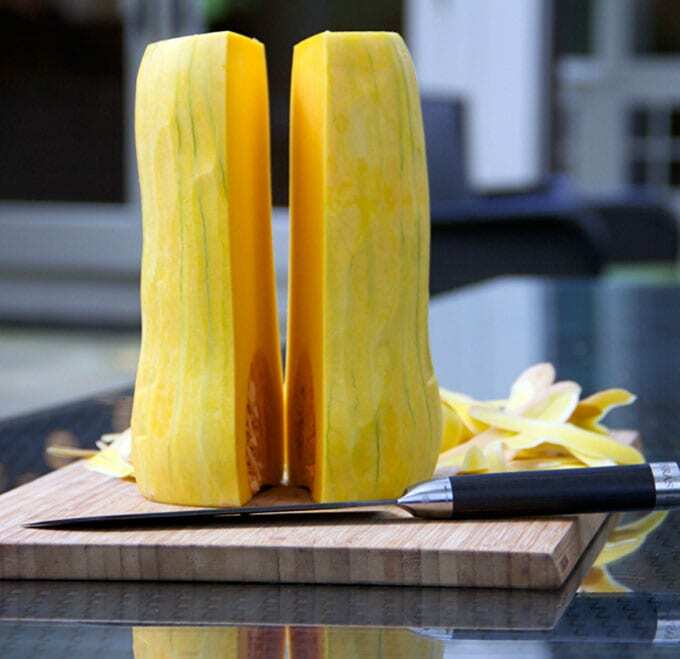 What a beautiful scene for peeling and chopping butternut squash. It looks like the thing to do on a lovely fall day.